Investment and international property management firm Mayfair & Morgan have launched a new internet based crowdfunding platform that will allow members to invest in residential property from £1,000 and make long term returns without the need to find property, source tenants and deal with property management. 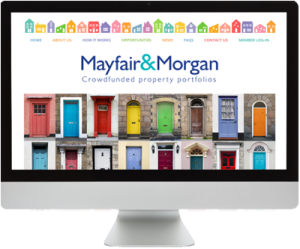 Mayfair & Morgan, unlike other crowdfunding companies have already bought the properties, found tenants and manages the properties on a day to day basis. Once the portfolio is fully funded investors will own a share of all the properties in the portfolio allowing them to spread their risk. Only registered members of the Mayfair and Morgan platform can request access to the various opportunities on offer and interested individuals should register at the website www.mayfairandmorgan.com. Ardnet Online Limited built the online platform and user management engine that drives the site, allowing the client to make regular changes and manage the subscribers in-house as well as keep a regularly updated blog. Visit the site today at www.mayfairandmorgan.com.